Want to keep your asphalt pavement looking great and lasting as long as possible? Professional asphalt maintenance, repair and rehabilitation is a great way to protect your investment and get the longest lifespan without having to spend the time and money on replacing worn out asphalt. As the seasons make the change over from fall to winter, Winsonsin residents must brace themselves for cold and snow. Road chemicals can make asphalt less slippery for driving but they can do a real job on the blacktop surface. As an expert in asphalt repairs and maintenance Seal King contractors provide services that can actually save you time and money. Preventative maintenance can go a long way in preserving the integrity of asphalt parking lots. Seal King expert technicians can quickly transform a tired out parking lot into a more durable and beautiful surface that can last for much longer. Cost saving solutions provided by experienced asphalt specialists include the following services for Wisconsin parking lots. Asphalt cleaning using proven techniques. Professional sealcoat application of a hot mix sealer made of the highest quality materials. Asphalt crack filling and sealing to seal up cracks and crevices before liquids and debris can reach the base layer and cause corrosion. Asphalt patching or overlay where damage has gone beyond the surface and needs repair. Asphalt pavement marking and line striping services for safety and convenience. No asphalt maintenance job is complete without the application of a high performance seal coat for residential and commercial projects. Sealcoating is one of the most cost effective ways to extend the lifespan of asphalt pavement. Relying on cheap do-it-yourself seal coat is not the right way to go about it. Experienced professionals use a higher quality mix that produces better results. The evidence can be seen in the way Seal King sealcoating looks better and lasts longer than bargain basement sealers. 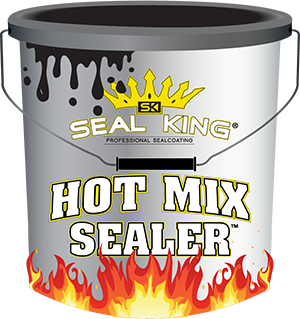 Seal King technicians are expertly trained on proper application techniques and the importance of applying only the best Hot Mix Sealer. 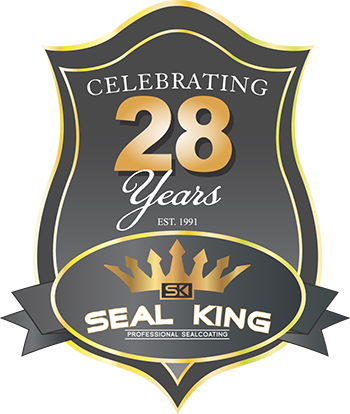 Seal King is widely known as an expert in the seal coating business but did you know that our contractors also provide excellent asphalt maintenance and repair services? Keeping up with asphalt pavement management is a no brainer if you want to protect the integrity of the pavement itself. 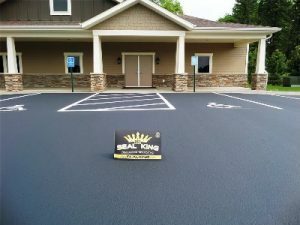 Whether you have a commercial parking lot or a residential driveway, making sure that non-highway surfaces are protected from sun, traffic, chemicals and outdoor elements is well worth the time it takes to make a call to your local Wisconsin Seal King contractor for professional sealcoating and repairs. This entry was posted	on Monday, November 19th, 2018 at 8:54 pm	and is filed under Asphalt Maintenance, Asphalt Repairs, Asphalt Sealcoating, Sealcoating Contractors, Wisconsin. You can follow any responses to this entry through the RSS 2.0 feed. You can leave a response, or trackback from your own site.